Nauti vierailusta kanssamme vuoden aikana! Lyhyt ajomatka Golf, Shopping, Dollywood ja Ober Gatlinburg Ski Resort. The location is fantastic. In the hills surrounding Gatlinburg you can easily get into town or the mountains. It is lovely and quiet with a great view from the private screened in porch. The two master suites are large, with king sized beds. 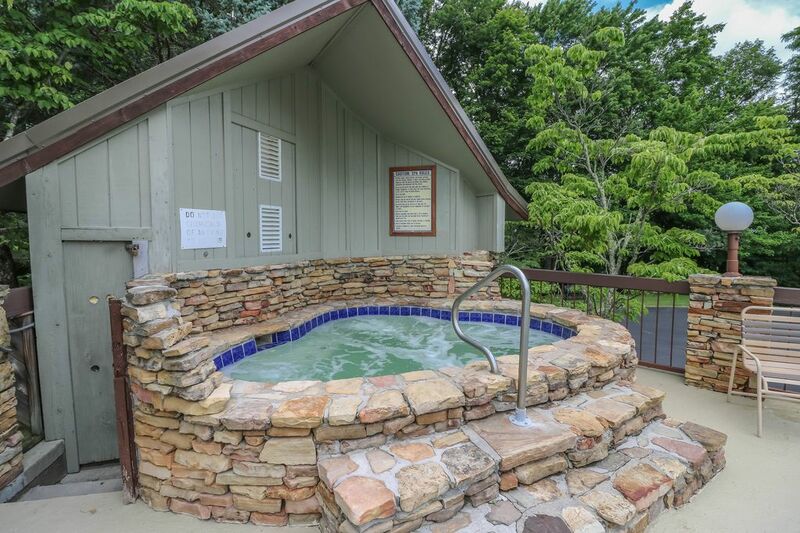 The minor issues include the fact that the hot tub is not open. Which my kids were super bummed about. The jets in the main bath tub cause the electric circuits to overload and trip the breaker. None of the DVD's work, which we found out due to rainy days that trapped us indoors. The fireplace doesn't work. We love to smokies and have been coming to Tennessee for years. Couple that with this amazing stay and it’s a recipe for the best relaxing southern hospitality you could ask for. We Will Be Back! We appreciate your feedback. We were able to get a representative out there within a couple of minutes, and was able to get the lockbox open for you, given that there was nothing wrong with the lockbox. Our team was able to get to you within minutes, the benefits of working with a management company. An individual owner wouldn't have been able to get to you in such a timely manner. The fireplace is listed as a "Stacked Stone Fireplace" and works perfect for the cabin to keep you warm and for you to enjoy in the winter months. We do apologize that there wasn't "ingredients" there for you to cook with, however, the cabin does offer enough utensils and cookware for you to cook a meal for you and your family. Thank you for your feedback, it helps us improve for our upcoming guests. We hope that you decide to stay with us again. Clean well stocked property. From the condo, it was downhill all the way(uphill to get there). The place is like home. It’s clean and warm. The view is absolutely beautiful! I would come back. It’s a lovely place. I also want to let people know that they will losse their phones and Internet connection when leaving the condon, and that was the only inconvenience we had. So my advice is for you to check the number of the condon, the code to get in and internet information before you go up the mountain. Enjoy the rest!!! !